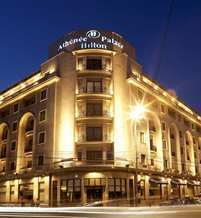 Located in the heart of the city centre, the Athénée Palace Hilton features 272 luxurious guest rooms and suites. The hotel is within walking distance of the shops, business centre, museums and downtown entertainment facilities and only 20 minutes' drive from the airport. Built in 1914, the Athénée Palace has long been synonymous with the highest standards of service, comfort and cuisine for international travellers. In 1997 it was completely renovated and restored to its former glory under the management of Hilton. The hotel is a perfect combination between old architectural style and modern construction. It was renovated a few years ago and since it became one of the finest hotels in Romania. Ideally located at the prime spot of the city of Bucharest enjoying great transportation links, shopping centers, financial districts and entertainment escapades.